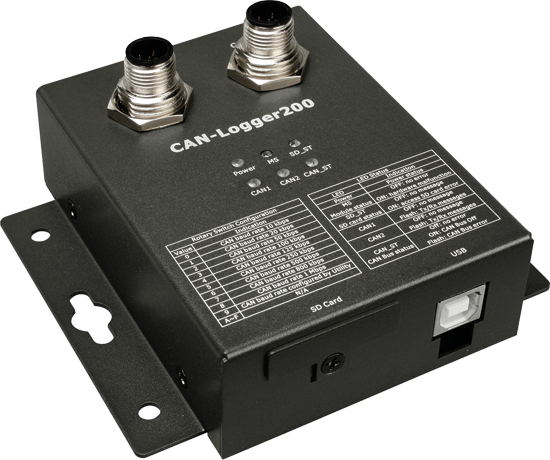 The CAN-Logger200 from ICPDAS is equipped with two M12-designed CAN interfaces and an exchangeable SD card for temporary data storage. The in-device 120‑Ω termination resistor can be activated via DIP (dual in-line package) switch. The user can individually set the bit rate (up to 1 Mbit/s), the CAN protocol (11‑bit identifier base frame format or 29‑bit identifier extended frame format), and the CAN silent mode of the data-logger for each interface separately. With the programmable recording filter, configuration options for receiving, filtering, and storing CAN messages can be defined. Due to the processor of the product, it can receive up to 150 000 messages per second with time stamp (10 μs clocking). The storage capacity of the 32‑GiB SD (secure digital) card allows recordings over a longer period of time. For further analysis, the data can be transferred to a PC via SD-card or directly via USB. Software drivers for several Windows versions are available. CSS (Denmark) has developed the CANLogger3000. It stores the recorded data on a 16-GiB SD-card.